The Saint-Emilion wine region is steeped in history and tradition. We take a closer look. 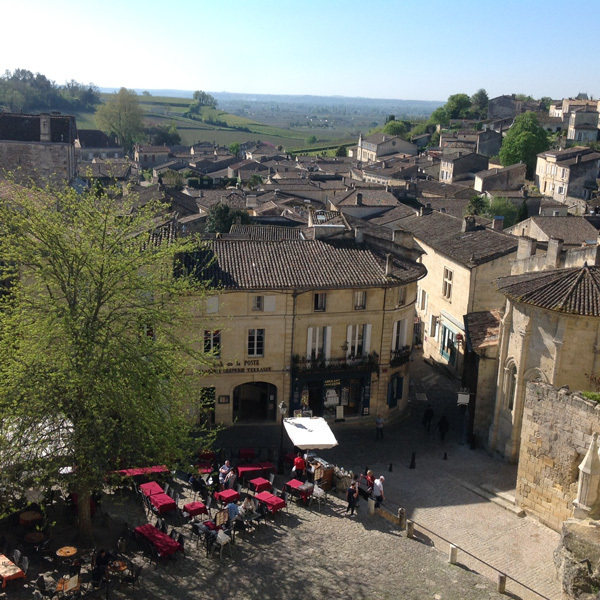 Village life: The Saint-Emilion wine region. The Saint-Emilion wine region is just 50 kilometres from Bordeaux, but it’s steeped in its own history and tradition. Harvest is a special time in Saint-Emilion, and one the comes with its own traditions. The harvest kicks off with a torch-lit procession through the village. Chateau owners form the Jurande – a wine brotherhood created in 1199 – parade through the streets in red robes. The next day, they climb to the top of the Tour du Roy, a Roman-era landmark, to signal the start of the harvest. They let black and purple balloons go from its terraces, with the colours intended to look like bunches of grapes floating up into the heavens. But the Tour du Roy isn’t the only place to go for great views of this picturesque corner of France. You can also climb the 196 steps of the 68-metre-high bell tower inside the town’s monolithic church. The views from the top are breath-taking. The church itself is a cave-rich historic monument carved out of the rocky landscape. (Saint-Emilion hides some 70 hectares of limestone caves underneath its cobbled streets and vines). The Saint-Emilion wine region is one of Bordeaux’s most famous appellations, as well as one of its largest and most productive. The entire area is covered by a UNESCO World Heritage listing that came into effect in December 1999. It includes around 5000 hectares of vines, which in turn are divided among eight villages. These combine to form the ‘Saint-Emilion Jurisdiction’. In addition to Saint-Emilion itself, the jurisdiction includes the villages of Saint-Laurent des Combes, Saint-Christophe des Bardes, Saint-Pey-d’Armens, Saint-Etienne de Lisse, Saint Sulpice of Faleyrens, Saint-Hippolyte and Vignonet. The local tourist board website has an overview of each village. Wine-making in Saint-Emilion dates back to Roman times. Today, just four grape varieties can be used in bottles carrying Saint-Emilion on the label. Merlot and Cabernet Franc – the two dominant grapes – can be used alongside Malbec and Sauvignon. 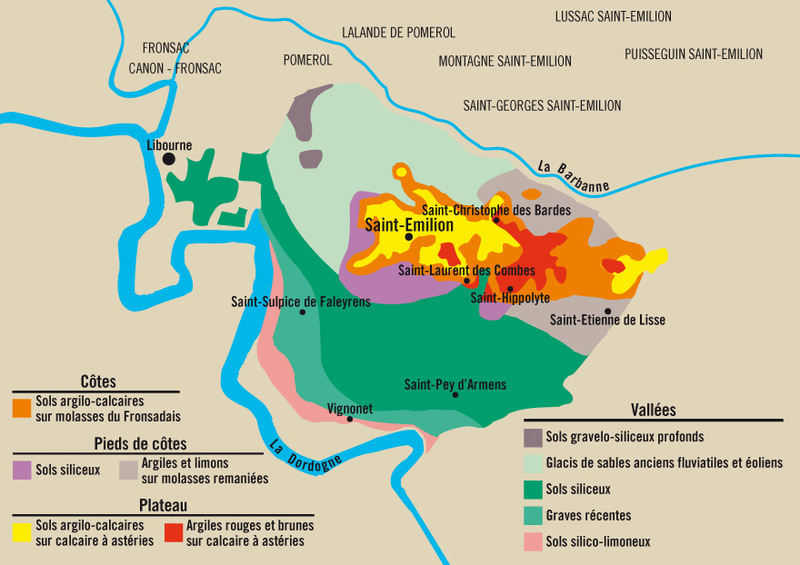 In addition to the main Saint-Emilion estates, there are also four smaller ‘satellite’ appellations: Lussac-Saint-Émilion, Montagne-Saint-Émilion, Puisseguin-Saint-Émilion, and Saint-Georges-Saint-Émilion. The soil in Saint-Emilion varies but three types generally dominate: there’s the limestone plateau, the slopes near the plateau, and then the flat areas surrounding the plateau. Traditionally the better wines have been produced on the hillsides close to the village. However in reality there are now dozens of chateaux producing world-class wine in Saint-Emilion. Saint-Emilion produces a wide range of wines – among the most varied in the Bordeaux region. Sandier soils lend themselves to lighter wines with a fruitier sensation, while heavier clay and limestone soils produce much richer wines that age better over longer periods of time. The Merlot grapes give the wines softer textures with red fruit flavours like blackberry, cherry and plum, along with liquorice and chocolate sensations. Cabernet Franc complements these with spice and flower aromas. The Cabernet Franc is used to add structure. 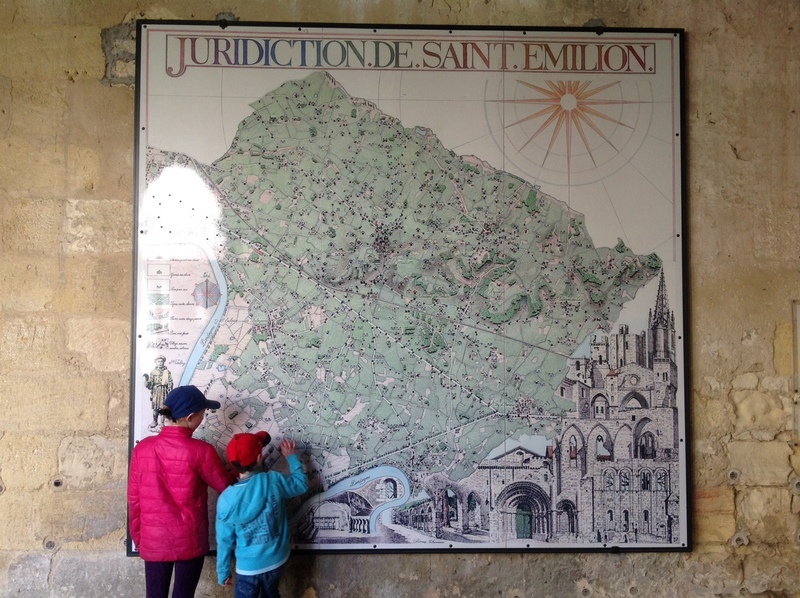 A map of the Saint-Emilion wine-growing region at the Collegiate church in the village centre. The more limestone in the soil of the vineyard, the deeper and spicier the wines can be, but the magic of Saint-Emilion is in its diversity and range of flavours. Savvy wine buyers can find real bargains in Saint-Emilion and its satellite appellations. If you’re looking to stock your cellar, we can help you find the wines you want at the prices you need. 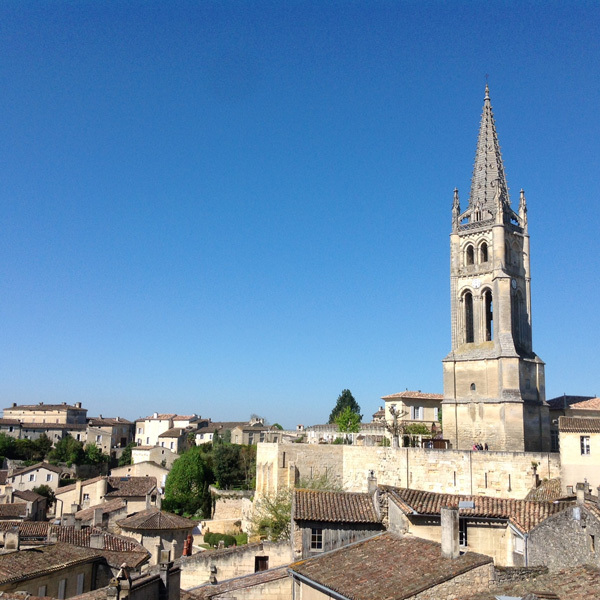 Saint-Emilion is also a wonderful place to experience both old and new Bordeaux. Producers in Saint-Emilion use modern techniques alongside ancient traditions. Grapes are still picked by hand, but various innovations are used at the winery level to help increase both the quality and the cost-effectiveness of winemaking. For example, optical sorting machines were pioneered in Saint-Emilion, in part by Gerard Perse, of Chateau Pavie fame. The machine sorts the fruit according to grape colour or size, and also removes unwanted leaves from the equation. Harvest time is the perfect time to visit Saint-Emilion to discover the area’s mix of old and new traditions. We can include Saint-Emilion on your Bordeaux holiday itinerary, including winery tours and tastings, gourmet picnics and lunches in wine estates. We can also arrange blending lessons so you can create your own wines. And of course there’s the nearby Grand-Saint Emilionnais for golfers.